You cannot listen to the pronunciation of ren zhong because your browser does not support the audio element. 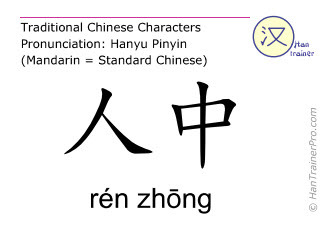 The modern (simplified) Chinese characters of rén zhōng are identical with the traditional characters displayed above. man | center | center of the man | "GV26 is also named 水溝 (shŭi gōu)"